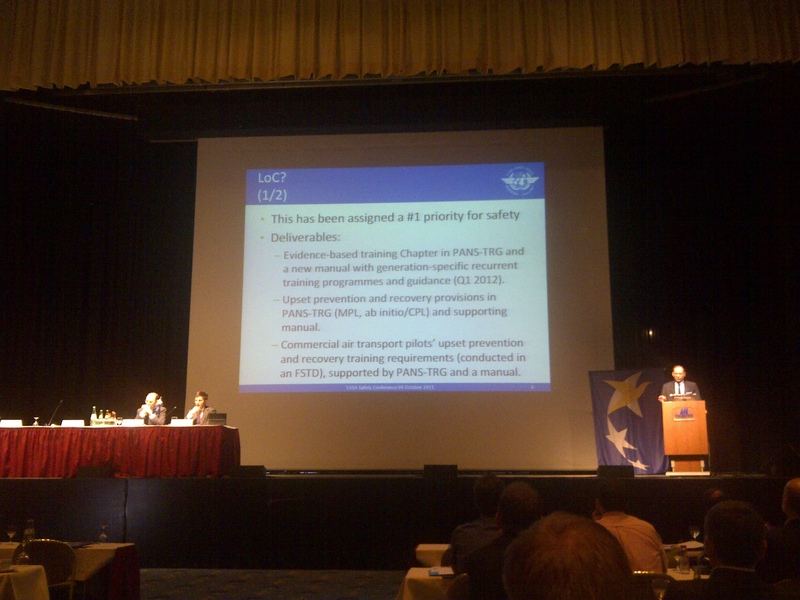 The European Aviation Safety Agency (EASA) today, October 4, opened their third aviation safety conference. The conference is being attended by 250 professionals from the aviation industry. The theme for the two-day conference is “Loss of Control”. A topic well chosen because Loss of Control (LoC) accidents are considered a safety priority by many organisations. This was again confirmed by speakers today. EASA research of airliner accidents over the past decade showed that 25% of all fatal accidents are caused by Loss of Control. Additionaly, ICAO data supports the conclusion that LoC accident account for most fatalities. It is one of four safety priorities for ICAO. And alarmingly, the LoC accident rate is not decreasing. But how to decrease the number of LoC accidents? ICAO suggests that it should be a global approach with harmonization of efforts. Meanwhile several organisations are involved in research in relation to (aspects of) LoC. Some speakers noted that the monitoring skills of the ‘pilot monitoring’, or ‘ pilot not flying’ should be strengthened. With enhanced monitoring skills a copilot could be even better prepared to anticipate and recognize signs that, for instance a stall is imminent. But not it is not just monitoring skills. A French study in 2008 reported that many copilots felt that they were not adequately prepared for surprising situations. It should be considered to take these kind of situations into account during pilot training. Especially given the growing automation on today’s flight decks. It is getting harder to anticipate all different failure modes in these automated systems. More so since several systems like Electronic Flight Bags do not go through the same certification processes as aircraft systems. However, a slight change in training would not be sufficient, according to Jean Pariès. He even suggested a paradigm shift for training as a whole to, “”recognize real world unpredictability.. and to maintain/develop resilience features”. 23 Aug 2000 – A320 at Bahrain: nose down input by the captain during a night time go around; crash into the sea. 22 Dec 1999 – B747F near London-Stansted: captain lost control when his ADI failed. 23 Sep 2007 – B737-300 near Bournemouth, UK. Unrecognized disengaing of autothrottle during final approach. 14 Sep 2008 – B737-500 near Perm, Russia: loss of spatial orientation of the crew during night time approach, pilot not familiar with Western ADI’s. 25 Feb 2009 – B737-800 near Amsterdam-Schiphol Airport: Stall following undetected autothrottle thrust reduction during final approach.